"GOOD MORNING, ALEXANDER," FATHER SAID. "TIME FOR BREAKFAST, AND THEN LET'S PLAY BALL!" "I AM NOT ALEXANDER," SAID THE LITTLE BOY. "THEN WHO'S BEEN SLEEPING IN MY SON'S BED?" ASKED THE FATHER. "I AM THEODORE! THE GREATEST, GRANDEST PRESIDENT WHO EVER WAS." "WELL, THEODORE, PARK YOURSELF HERE AND SAVE YOUR ENERGY FOR TODAY'S GAME." Changeable Charlie has nothing on this little redhead, who is an obvious biography buff and changes his persona faster than the weather. When his dad tries to hurry the process along, our little boy has a mood change. "I AM NOT THEODORE! I AM THOMAS, THE GREATEST INVENTOR WHO EVER WAS." "WELL, THOMAS, LET ME THAT BRILLIANT SMILE LIGHT UP THE ROOM." "MY NAME IS NOT FRED! I AM JACKIE, THE BRAVEST, BALL PLAYER WHO EVER STOLE HOME PLATE." "WELL, JACKIE, YOU STOLE MY HEART. NOW CLEAN HOME PLATE!" And at PJ time, "Jackie" pays his patient papa the the ultimate compliment in his book; he's not Jackie, he declares. "I AM DADDY, THE GREATEST FATHER WHO EVER WAS!" In her new companion book to the popular My Name Is Not Isabella: Just How Big Can a Little Girl Dream? 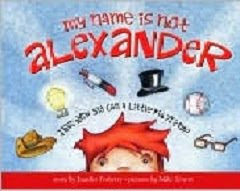 (see my recent review here), author Jennifer Fosberry and able illustrator Tim Litwin continue their famous name-dropping tour of some popular elementary school biographical figures in their latest, My Name Is Not Alexander, this time focusing on male personages. Pair these two to introduce a unit on biographies of famous Americans, abetted by Fosberry's brief appendix with biographical sketches of each of Alexander's alter egos and an ample list of web sites to explore the lives of his heroes.